In Asia, we have been reading a lot of detective novels but the masters were Conan Doyle and Agatha Christie. Things change, two writers tell us that Asia and particularly Malaysia can be a particularly suitable environment. 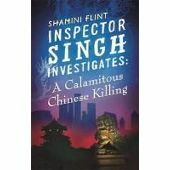 Shamini Flint has even sold the worldwide rights of her books to an English subsidiary of the Hachette Group. Both novels were translated into French (1 ) and the third one will be released within a few days. Her sixth novel, very pleasant, leads us to Beijing. 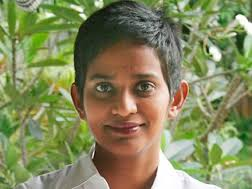 Shamini Flint is 45 years old, she was born in Malaysia and studied with outstanding results law in Malaysia and the UK where she met her husband, an English economist, Simon Flint. She worked for a law firm in Malaysia ( Zain ) and for Linklaters in Singapore. She resigned in 2004 to take care of her two children. She got a little bored, and regretted her job; she teached law at the National University of Singapore and was campaigning for environmental groups and in favor of fair trade. She began to write books for children: a small girl Sasha, was visiting several Asian capitals which Shamini knows very well after all her business trips. The hero of the detective novels, Singh, was an obvious choice: he had to be an Indian. He is a Sikh with his turban, his shorts, his sport shoes and his love for beer and curries. His wife is very stubborn, however she is a wonderful cook and all dialogues, as Shamini tells us, are simply what she heard in her family. Singh has difficult relations with his supervisor, a Singapore Chinese, who is not fond of his methods, of his outfit and has a highly developed political sense that could make him forget justice. Her first novel published by her publishing company ” Sunbear ” has had good success in Singapore. A murder in Kuala Lumpur is a trauma for a Chinese family, wealthy with logging in Borneo. Singh is called by the wife of the victim, a former top model from Singapore who is accused of murder. The book is in no way condescending towards Malays as sometimes some novels written in Singapore. Shamini criticizes the over perfect and rather cold organization in Singapore and enjoys the charm of Kuala Lumpur. However, she evokes the corruption in Malaysia, particularly in Borneo and the growing importance of Islam and Islamic courts. Finally she pictures the role of a young Englishman with the Penan tribe in Borneo, inspired by the Swiss activist Bruno Manser who disappeared and has never been found. The novel is pleasant to read, the detective plot of the following books will be more sophisticated. With her third novel she certainly made no friends. An environment she knows well as she has worked for an international law firm. She describes the luxurious living conditions of these expatriates, the relations that can be difficult between the Chinese, Malays and Indians in Singapore. She shows us that justice can not be the same for all: it is better to be a white expatriate than a maid from the Philippines or even a gay lawyer of Indian origin . She highlights the very severe punishments for consumption and drug trafficking and the repression of homosexuality . The manager of a law firm is murdered. All partners could be guilty. Their weaknesses, insider trading , blackmail for sexual favors, drugs, greed, will lead to two additional murders … But Singh, despite the untimely interferences of his boss, who does not want the image of wealthy expatriates in Singapore to be tarnished, will allow justice to hang one of these lawyers. All these issues are well known, but she does not elaborate on the essential role of the Party and the absence of the rule of law; this is not a political novel and it is from this point of view, a little disappointing for a novelist who told us to have a passion for politics. In the 1970s, the province of Kelantan and the city of Kota Bharu were poorly connected to the rest of the country and isolated during the monsoon flooding. Kelantan in the north-east, on the border with Thailand, was an independent sultanate until the 18th century, and then a protectorate of the Kingdom of Siam and finally controlled by the British in 1909 . It is a stronghold of values and Malay culture, led since 1990 by the fundamentalist party PAS. The book introduces us to the ladies of the market of Kota Bharu. “Kelantanese men were famous for letting their women make money while they sit in coffee shops talking politics” (p.28). But the originality of this novel is to take place in a shadow play theater ( Wayang Siam ) where we meet the puppet master ( dalang ) and the musicians . 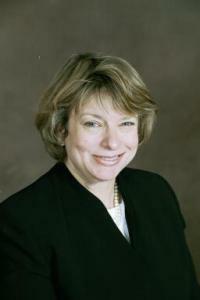 The author of the novel ” Shadow Play ” ( 3) is …an American, Barbara Ismail. Born in Brooklyn, she attended her freshman year in Java to learn Malay with the anthropologist Douglas Raybeck who was pursuing research in Kelantan. From 1977 to 1982, she will study the dialect of Kelantan and Wayang Siam. Her thesis will be published by Yale University in 1980. She has two daughters, Jerusha and Arielle and is the sister in law of Dr. Yaacob Ibrahim, the Minister of Information and Communication of Singapore. She plans to publish a serie of detective novels located in Kelantan. The second novel ” Princess Play ” is already released as an e -book and the third ” Songbird ” begins with a singing contest ( barung merbok ) . 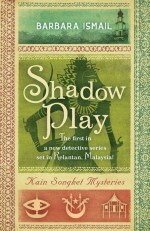 I read ” Shadow Play ” with great pleasure, and I know enough about Malaysia and its culture to appreciate the authenticity of this book, its characters and the environment. She speaks more about witchcraft than Islam and no mention is made of the political and religious tensions, or the impact of PAS. The plot is well organized with an investigation subcontracted by a Malaysian police officer from the west coast, completely lost, to efficient women of the Kota Bharu market who will find the culprits. 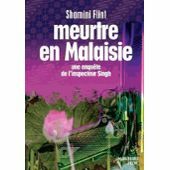 (1) Shamini Flint, ” Murder in Malaysia “, translated from the English by Dominique Brotot . Marabout Poche, June 2013. Shamini Flint, ” Conspiracy in Bali .” Marabout Poche, June 2013. Shamini Flint, “Infamies in Singapore ” Marabout Poche, February 2014. (2) Shamini Flint, ” A calamitous Chinese killing .” Piatkus 2013. Shamini Flint, “A most peculiar Malaysian murder”. Piatkus 2009. (3) Barbara Ismail “Shadow Play”, Monsoon Books, Singapore.